Every Monday morning, nearly 30 sixth grade boys meet with community volunteers in the Health Sciences Academy at Monroe Middle’s media center. At times, they may be learning how to tie a tie. Other times, they may be practicing the correct way to properly introduce themselves to someone. 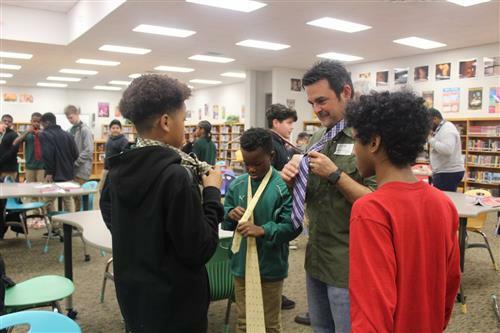 They’re the inaugural class of the middle school’s 1 Million Men in the Making program, a mentoring initiative spearheaded by Heart for Monroe that focuses on developing character and confidence in young men. As part of the 1 Million Men in the Making program, mentors help their mentees develop life skills (i.e., job interview skills, money management, etc.) and personal character attributes (i.e., leadership, responsibility, etc.). The data-driven program will monitor the participants’ school performance and provide results at the end of the school year. Wingate University senior Nate Ogutu said when he heard about the 1 Million Men in the Making program, he didn’t hesitate to sign up. Since their induction, the mentees and mentors have participated in team-building exercises, learned the proper way to dress in a variety of settings as well as proper etiquette when meeting someone for the first time. As he watched several mentees leave the media center at the end of their weekly meeting, some of whom were proudly wearing their 1 Million Men in the Making t-shirts, Nate said he has enjoyed getting to know the students during the past month and looks forward to coming back each week.